It was an uneventful trip over to get little Bella yesterday. 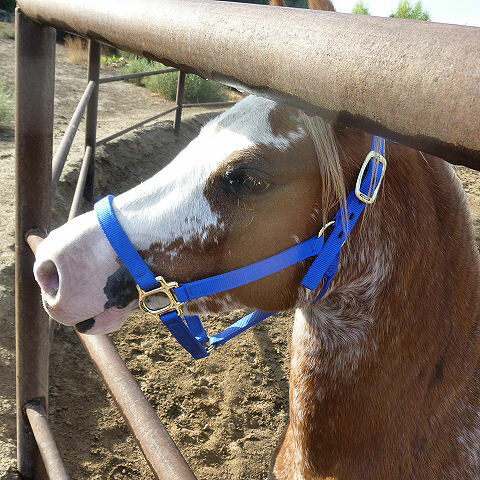 She loaded beautifully, though she’d never seen a step-up trailer before, and rode quietly. The trailer might have been empty both ways, for all we could tell. I let her (and me) rest for several hours and then got her out and led her around a little last night. She was a perfect lady, only a little wide-eyed. 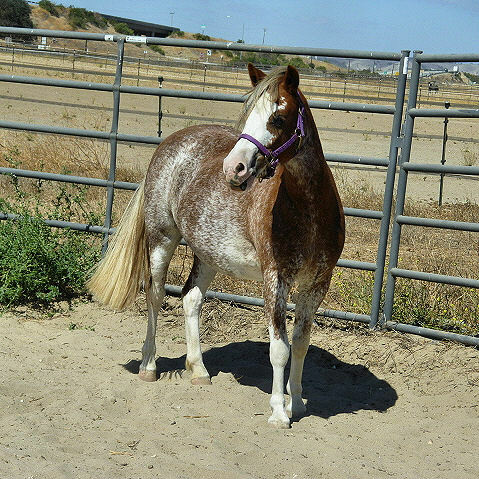 This morning I got her out again and led her around a bit before I took her down to the round pen and turned her out. I had a hard time getting her out of my pocket — she wanted to follow me around the pen, and I didn’t want to shoo her away at this stage in our relationship. So I finally went just outside the pen and waited. First she explored it very carefully. Then she consented to run around and kick up her heels a bit. Then she came over to see what I was doing. I wanted a head shot, but had a hard time getting anything but The Nose. Luckily, she saw something up on the highway that caught her attention. After that, we toured the ranch a little more. We walked through the double tunnels that lead under the highway — no problem. She hasn’t yet even taken the slack out of the lead rope. We’ve seen colts come in that were perfectly civilized at home, but come out of the trailer here as dancing, screaming nervous wrecks. Now if the weather were just as pleasing — it’s very hot and thunderstorms are threatening. Well, that’s what always seems to happen during the Fair; either that or howling dust storms. It’s October tomorrow, though, so surely the heat can’t last much longer. Or rots o’ ruck, as Scooby-Doo would say. 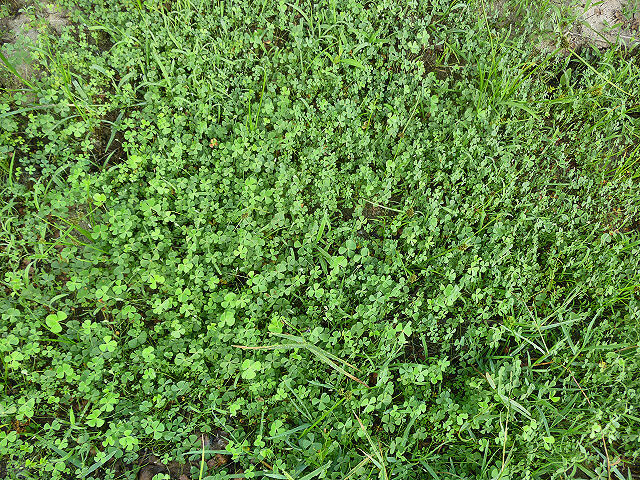 Out on my walk this morning, I found a sea of four-leaf clovers in the riverbed. I’ve written about these before. 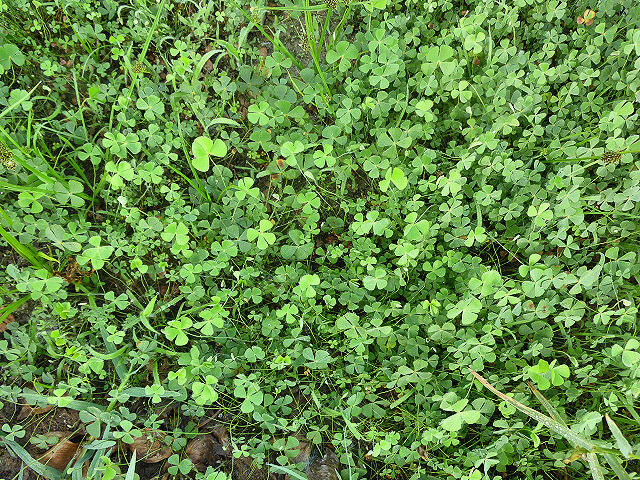 They’re not actually four-leaf clovers, but a fern, Marsilea quadrifolia, or European waterclover. It’s just that I’ve never seen it so thick. Wikipedia says it has a lot of medicinal uses, and also makes a nice pot or aquarium plant. I intended to pot some up last year and never made it; maybe I’ll do it this year. I won’t be blogging tomorrow, as Andrew and I are headed to the coast to pick up little Acappella. We’re going to leave around six, and hope to be back in time to beat the worst of the heat. It’s been hotter over there than it is here. It’ll be strange to be coming back to cooler weather! Here’s hoping the traffic won’t be too bad, and everything will go smoothly. Wish us rots o’ ruck! We got lucky. It was a couple of neighborhood kids that took it, and they got it clear up to Lake Ming before they got caught. It’s in good shape, and was back in time for the last feeding yesterday. 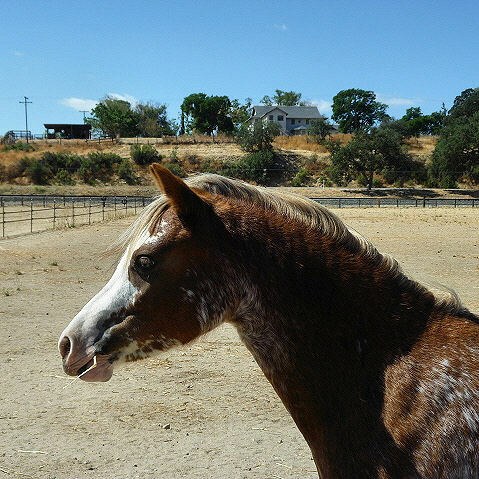 A few days ago one of our boarders, Debbie, was asking about the wildlife around the ranch. I took her on a walk around the place looking for tracks. We struck pay dirt down by the river. 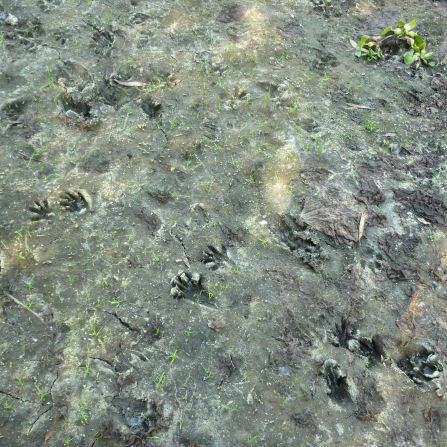 I’m reminded of those dinosaur trackways you see on nature programs. Anyway, I’d say we had a few raccoons, at least! Let me hasten to assure you there are no actual wild horses or runaway quads. The quad is gone, all right, but it was stolen last night. We got a call after eleven. It was Scott, and the quad used for feeding was at that point headed south on Manor at a high rate of speed. Whoever took it pushed it away from the mobile home where it’s parked, and he heard it start up too late to do much about it. By the time he got dressed and out there, it was long gone. Billy went over and talked to him. It’s not likely to be recovered. At least it’s too small to cause a major crash if it’s used for joyriding, but it’s more likely to end up as assorted parts at the swap meet. The wild horses, though, are on the patio. 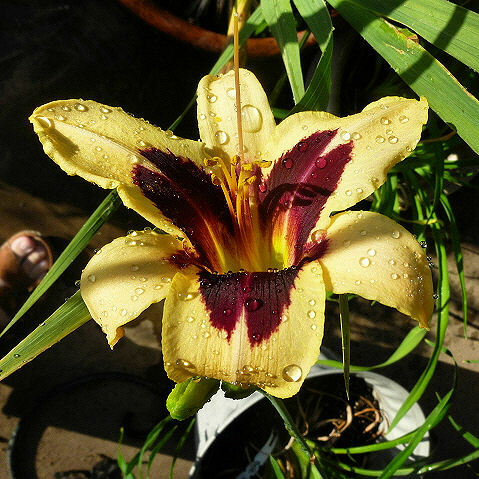 Wild Horses is the name of one of the daylilies I bought over at the coast. 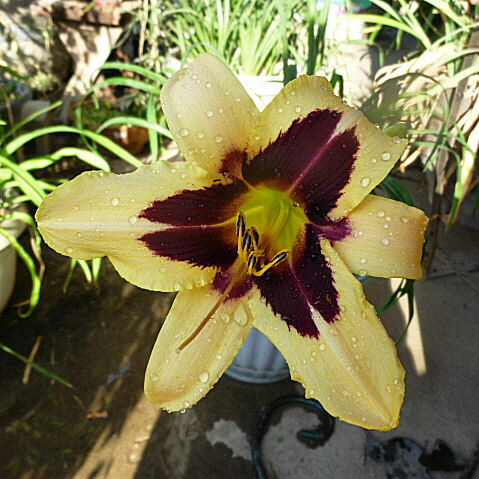 It bloomed much later than the others. 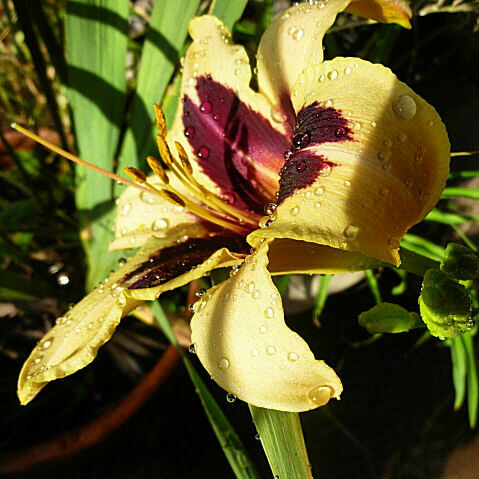 It’s a creamy yellow with a dark red-violet eye, almost black in some lights. It was a bonus plant, picked out by the grower. I don’t know if I would have chosen it myself, but I find I do like its dramatic coloring. And it’s not likely to get stolen from the patio. Andrew came by yesterday to ask if I wanted to go and watch his sister Sarah show her steer at the Kern County Fair. Of course I did, so this morning, we went to the fair. 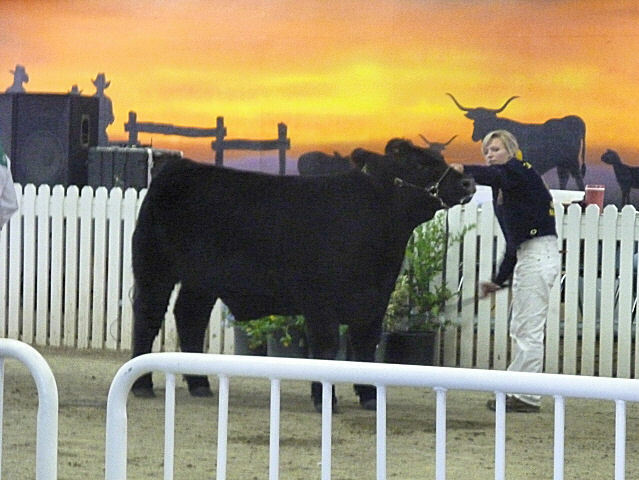 Sarah’s steer was quite impressive. She was very busy prepping him. 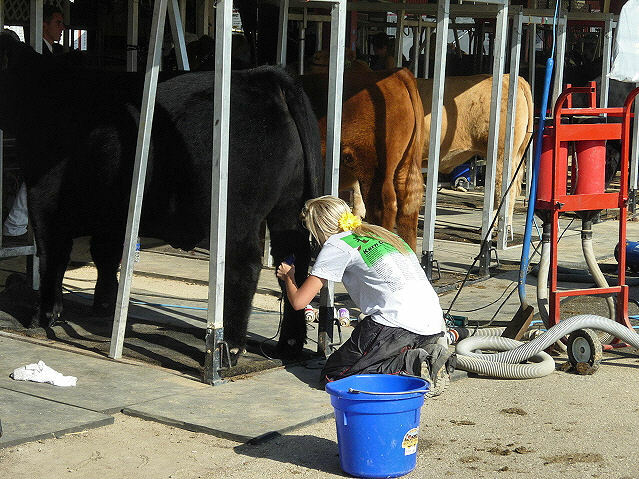 The barn aisles were loud with generators, vacuums, blowers — I never realized how much went into grooming a steer. This is not glamorous work. The kids really have to put in a lot of time and effort. 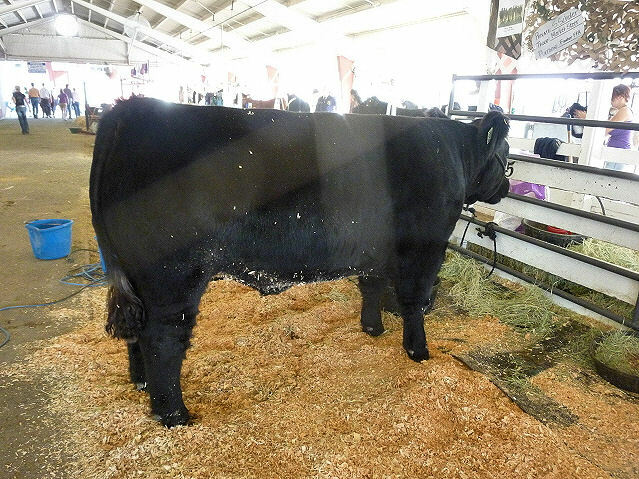 Here she is in the show ring. The light under the barns was odd. It was hard to get a good photo. She’s matured so much, growing into a tall, slender (and beautiful, to Grandma’s not unprejudiced eye) girl. This is a real character-building activity; you get out of it what you put into it. It was fun to watch, too. 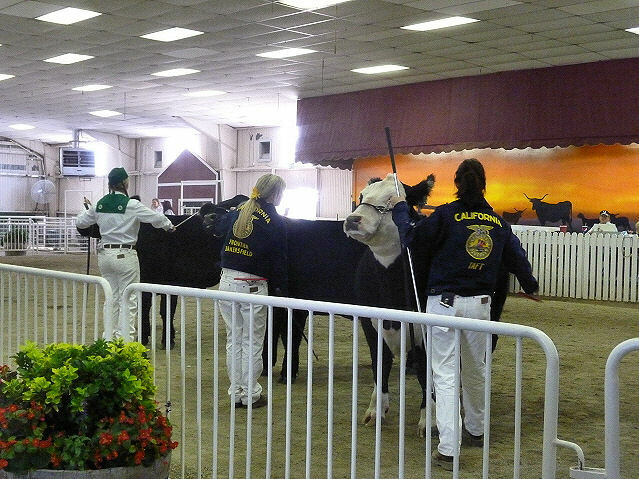 Some of the handlers were very small, and some of the steers were very uncooperative. Sarah’s already got plans for next year. 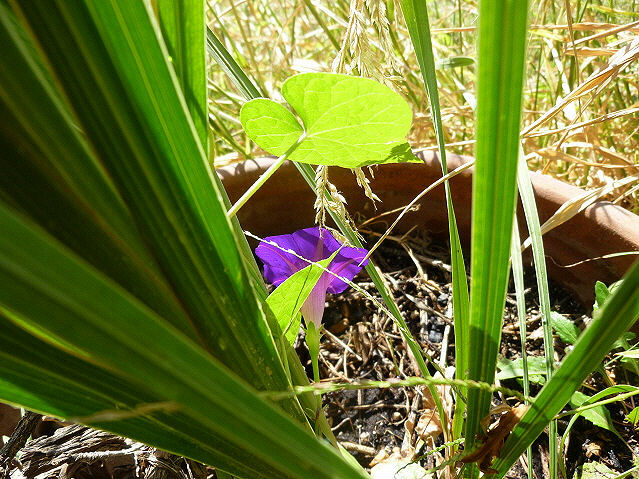 I was watering my plants yesterday, when I noticed a flash of purple. 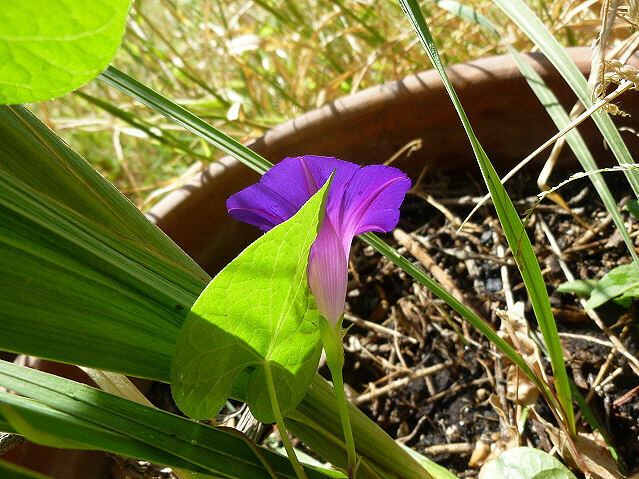 I looked at it more closely, thinking it a fallen petal or scrap of paper, but it was a lone morning glory. Now where did that come from? I planted no morning glories this year. It was climbing on my mystery glad, which I didn’t plant either. That seemed appropriate. It was certainly a brilliant purple, and it was gorgeous. 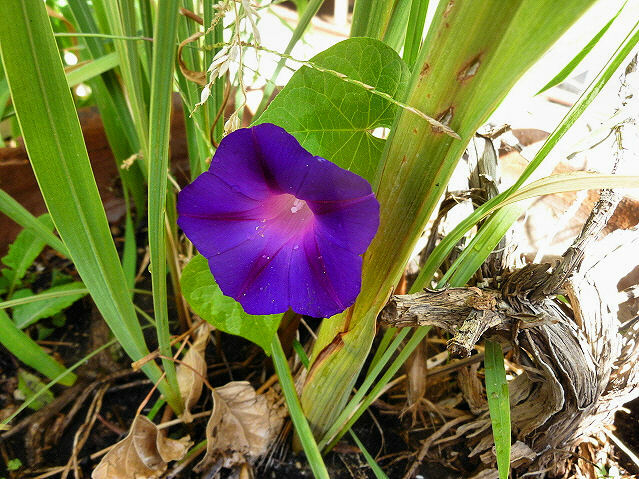 I did plant some morning glories of this brilliant violet color, but that was four or five years ago, at least. How did one lonely little seed manage to survive all that time? Well, I’ll just enjoy it. It’ll be interesting to see how tall it can get before frost. And this time I’ll save some seeds — on purpose. We had a lot of fun yesterday. Andrew, Courtney, Marion and I got into San Miguel about eleven, and had no problem finding the ranch. It’s an interesting place; a hundred acre rectangle sandwiched between the railroad and the Salinas River. It was a beautiful day, but with a high, cold wind gusting at intervals. You can see the dust blowing in the background of the first picture. At times there was a lot of dust; we had to turn our backs to the wind to breathe. Not ideal weather for looking at horses. Or ponies. 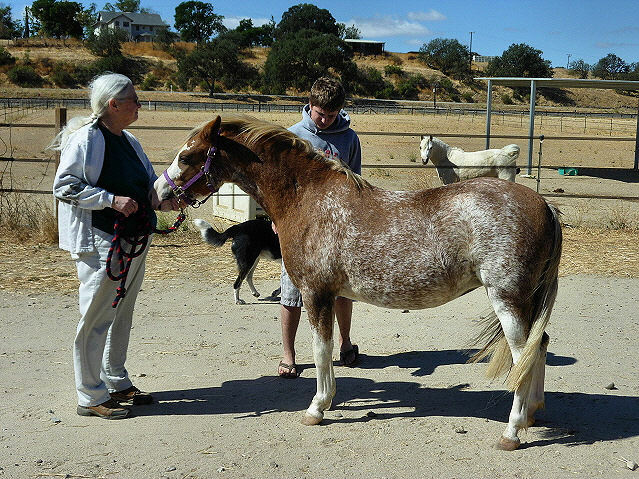 Owner Sarah welcomed us, and we took her golf cart out to meet the ponies. Of course, we looked a Acappella, aka Bella, first. She is a pretty little thing. She was a little jumpy in the wind, but was willing to listen to her handler. Andrew trotted her out for us. She had nice straight legs . . .
We examined her carefully. Her interested relatives are in the background. 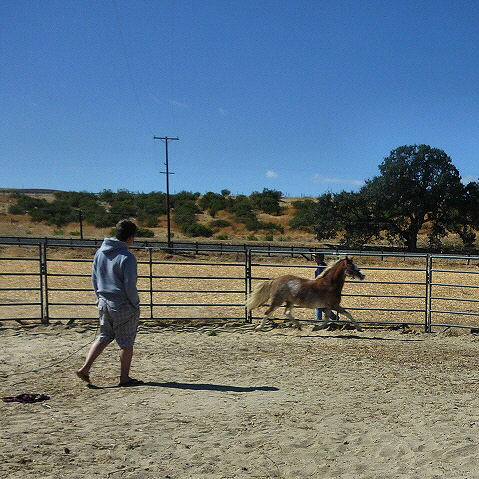 Then we took her down to the round pen to watch her move. 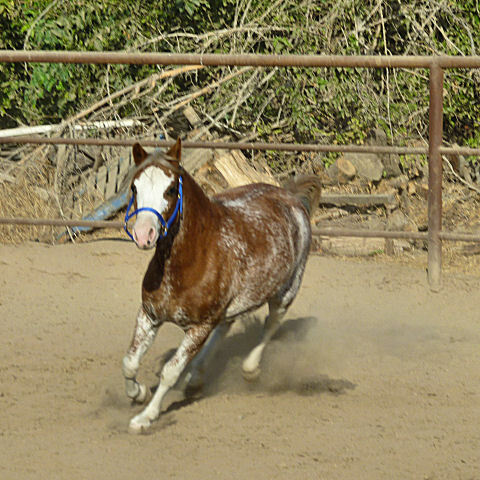 She has a lovely trot, striking out from the shoulder and driving behind. She did have the lovely head you want in a Welsh . . . In short, she was charming. And Sarah approved of us — so I bought her. 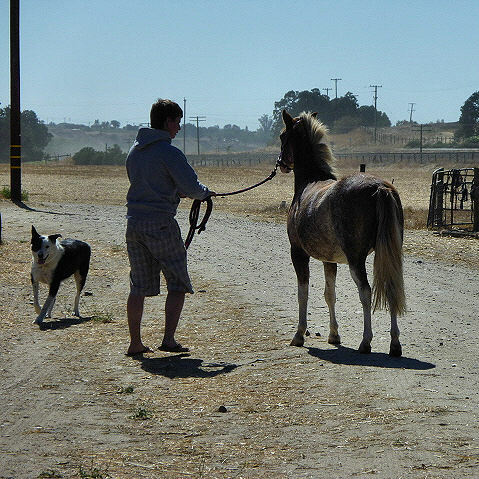 Actually, Andrew and Marion so liked her little brother that I thought we might end up with two ponies! But one is enough for one day. We left her there, planning to pick her up next Wednesday. We’ve been thinking about where we can put her. 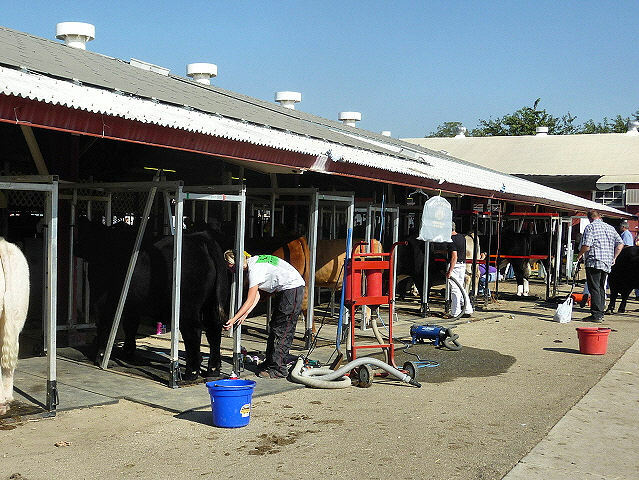 This morning I realized we had the ideal spot; a grassy little pen with tight fencing and plenty of shade. 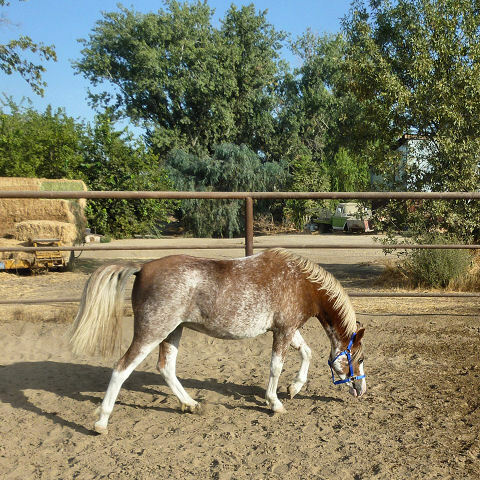 It’s small for a horse, but just right for a pony, until we decide upon a larger, permanent place. Today, I’ve been alternating between thinking, “What do you think you’re doing, buying a two-year-old baby?” and “Isn’t this going to be fun?” Luckily, the latter thought is the dominant one.